To improve texture and complexion of full body and to make skin even toned, various ubtans are being used from ancient times. Dry fruits, turmeric, milk, roots of some plants, flowers, multani mitti, perfume etc, all are still being used for brides. In our traditions, start of marriage ceremonies start with these ubtans only where some ubtan is applied on bride or groom. Not relating it to traditions, start using a good ubtan atleast 2 months before your marriage regularly and nothing will beat that glow and your healthy even skin. 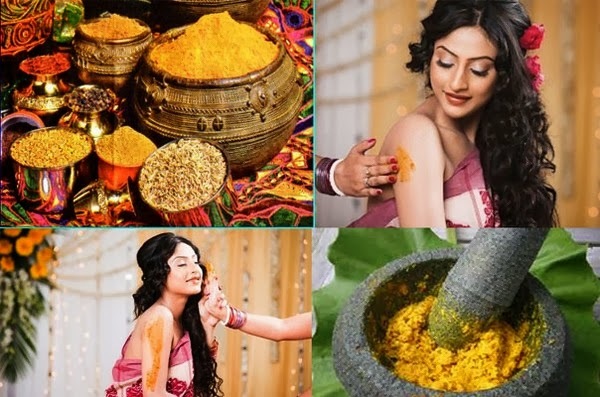 Mix gram flour, kasturi haldi (wild turmeric), milk cream, curd, honey, lemon and make a paste and apply this mix on your full body like ubtan. When it is semi dried, then rub it and take bath. Use a good body lotion afterwards. Don’t go for a fresh cut immediately before marriage. Don’t ever go for rebonding immediately before marriage as your hairstyle will ruin your rebonding. And if you visit some beachy location for your honeymoon, then the water will also damage your rebonding. IF you still want, then, go for a rebonding session at least a month in advance. Don’t go on a crash diet immediately before your marriage as this will only sap up your energy and you will only feel helpless and tired on your d-day and would not be able to bear the load of even your wedding attire which most of the times is a good 10-20 kgs J.
Don’t completely go by the trends. What’s in trend today will not be tomorrow but those beautiful memories of your wedding by means of photos and videos will remain forever. So choose wisely and don’t go by the statement looks. Instead opt for something classy that you would like to see forever. Choose your parlour wisely and ensure that all waterproof makeup is used. Who wants a runny mascara!! May be you won’t cry but you never know J.
Don’t go for too glossy or too matte. Glossy ones won’t stay for long while the matte ones will leave your lips dried and cakey. You have to stay put till morning. Indian marriages are too long almost 12 hours. Choose products considering that. Use good quality correctors or concealers to hide those under eye dark shadows. Don’t rush on makeup part. Give yourself enough time. Say, 45 mins to an hour for full makeup application on your wedding day. Eat but eat right and feel good. Be beautiful in your own way. Do what you feel like and be happy about it. It’s your day gal. Go for it. Stay beautiful forever J.